with a heaping helping of change here at Lucky 7. Some change can be fantastic. Like the return of clients who we haven't seen in years - due to the economy rocking their worlds. Change feels good in the fact that L7 is seeing a return to the fantastic number of customers we had before the dreaded "Great Recession" took a hold of our small resort town. Exasperating the tough economic years for L7 is/was the over abundance of mostly crappy, upstart tattoo shops opening constantly. They try to lure people in with impossibly low prices. Beside artistic skills, where do these people cut corners- perhaps in their health and safety expenses? Yikes! In addition, we had our former apprentice nut up - break his contract and quit during the July 4th weekend. That holiday is the busiest week of the year. This left us woefully short handed the entire season. We were disappointed and somewhat bitter for putting our collective "all" into his tattoo training and giving endless emotional support, then, when we are counting on him to be a team player, we ended up with just another "Generation Me" youngster who didn't honor his end of a traditional tattoo apprenticeship. Change has arrived in what piercings are the big sellers during the warmest of seasons. For the past two decades belly button adornment was my bread and butter. Even with the limitations the client has to endure. Such as no hot tubs, restricted swimming, etc. 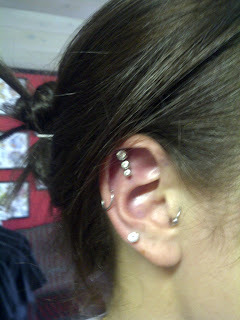 This year, especially this past summer, multipule helix piercing ruled the day. Coming in a close second would be the staying power of micro dermal anchors. I believe Dermal Anchors have a long future rather than being a flash in the pan. The versatility of these neat little buggers is a cool addition to an experienced body piercer's arsenal. If carefully placed to avoid friction on jewelry site - there is no limit as to placement. The problems we have encountered usually are from poor care, incomplete care instruction, poor placement, cheap jewelry or having the procedure performed with piercing needles. Also, seems like little kids LOVE to pull on them. So new mothers may want to wait. Super cool to see something new come around, light up peoples mind with the possibilities of dermal anchors. I have to say, dermals have been challenging, even fun to learn. Keeping your skills up to date, learning and trying new things keeps us rellavent no matter what we choose as our profession. Ear projects, such as the very popular Triple Helix piercing have become hugely popular this year especially this past summer. As piercers, we can thank photo sharing sites such as INSTAGRAM and PINTREST. These pictures places have shown a enourmous amount of people these super cool looks. Not too very long ago, having numerous ear piercings was considered somewhat taboo. Even as a sign of being loose or a misfit. A few smart Jewelry companies have released pieces that fit the ear cartilage well, with multiple options in size and colors for the ends. 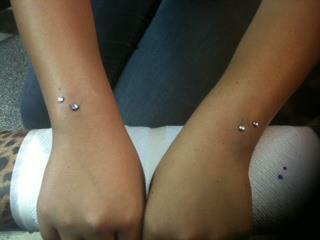 As with dermal anchors, healing can be a challenge that most clients have not experienced before. 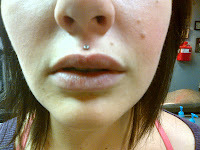 This is simply due to the clients having a more common piercings previously that require care for 2 or 3 months. With ear cartilage being a somewhat slower healing area, then adding multiple piercing sites at one time-it slows the whole healing process down to a trickle. Clients can become tired of the care routine, and be motivated to abandon the piercings - erroniously beleiving the piercings are "infected" and are never going to heal. Its important as their piercer to give as all information regarding the long healing process before the paperwork is signed. Being available for follow up advice during the healing period is also critical. in North Lake Tahoe "Shoulder Season." 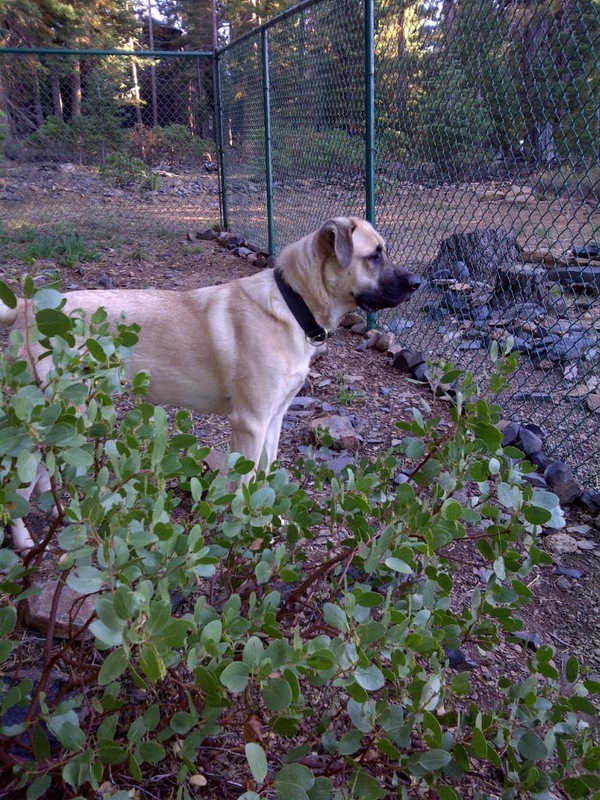 Fall is a slow time for all businesses in North Lake Tahoe. Too cool for the beach and water sports, yet no snow for winter sports. We locals have given this time of year its own handle. "SHOULDER SEASON." One change I want to make for Lucky 7 is to no longer have Fall be slower in Shoulder Season. To have it match Winter and Spring in client visits. I know that in a resort economy -and having my shop located on the boarder of the two "slowest states" to recover from the recession, this is a tall order. But I want that change. I am not going to let the nations economic issues I previously mentioned hold me back from achieving my vision of change. A Positive Mental Attitude, Focus and Drive mixed with a solid plan of action is what my "change" needs to succeed. Wee bit of luck never hurts either. Change is good! That's what I tell myself anyways......plus sitting around being mad at change never helps anyone deal with it. Being in CHARGE of change, or being the CAUSE of change feels much better than having it dumped in your lap, as far as I can tell. What are you changing this Fall?